Rendering of the proposed changes to Bogardus Plaza. The unofficial motto of the so-called “tactical urbanism” movement is to use short-term actions to bring about long-term change. Under the Bloomberg administration, New York City has championed the creation of affordable temporary pedestrian plazas carved from street space once given over to cars using little more than planters, benches, and paint. 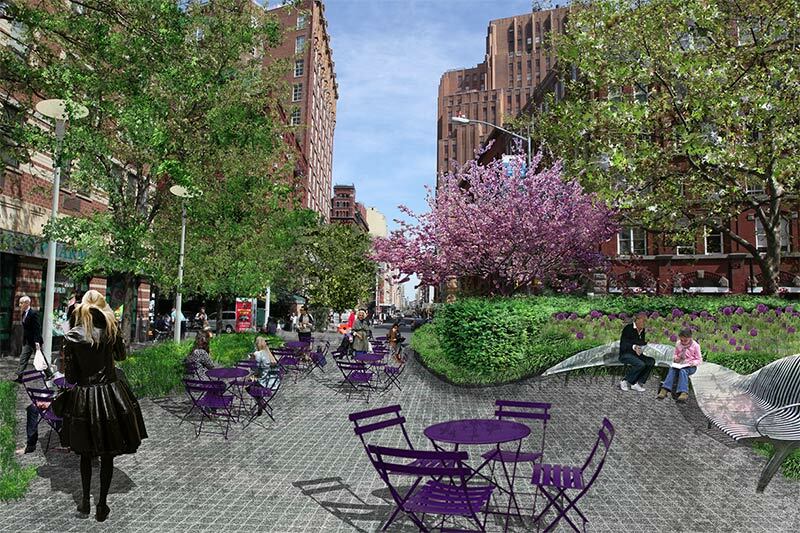 One of these plazas, at the southern edge of Tribeca, is about to make the jump from paint to permanent with a concept design by Mathews Nielsen Landscape Architects. Bogardus Plaza, named after the architect and pioneer of cast-iron buildings, James Bogardus, was created in 2010 by closing the southernmost block of Hudson Street where it intersects with Chambers Street and West Broadway. “This section of Hudson Street has always been somewhat of an anomaly,” said Mathews Nielsen principal Signe Nielsen, who lives in Tribeca. Being at the southern end of the neighborhood, Nielsen said Bogardus Plaza isn’t part of what’s generally considered the “Tribeca enclave” of wealthy residents. With a busy subway station inside the plaza, she said the populations who the use public space change throughout the day as students, jurors at the nearby courts, and office-workers are replaced by residents in the evening. Site plan showing Bogardus Garden wrapping around a seating area (left). 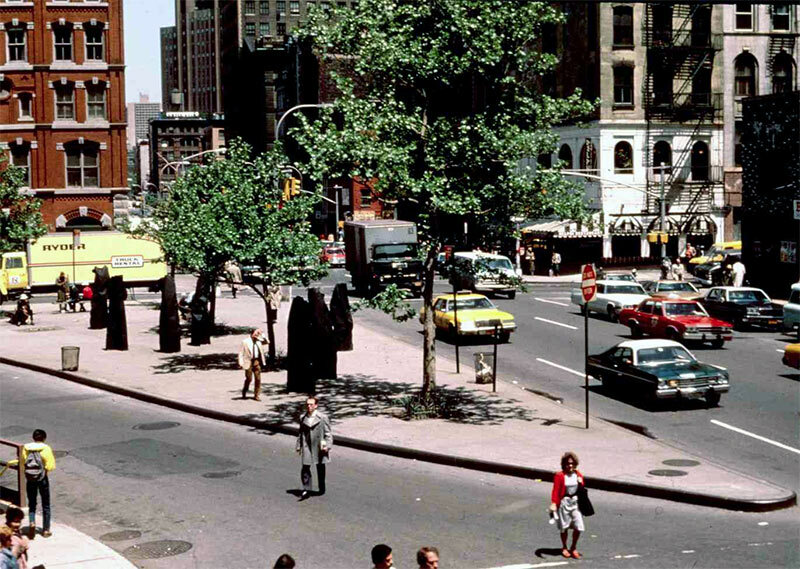 Bogardus Plaza in the late 1970s (right). The transformation of Bogardus Plaza has been ongoing since the 1970s when the space was little more than a concrete traffic island. The Friends of Bogardus Garden initiated the transformation by tearing out the concrete in the 1990s and building a tree-filled green space surrounded by a tall iron fence serving as a visual and acoustic buffer to busy West Broadway. 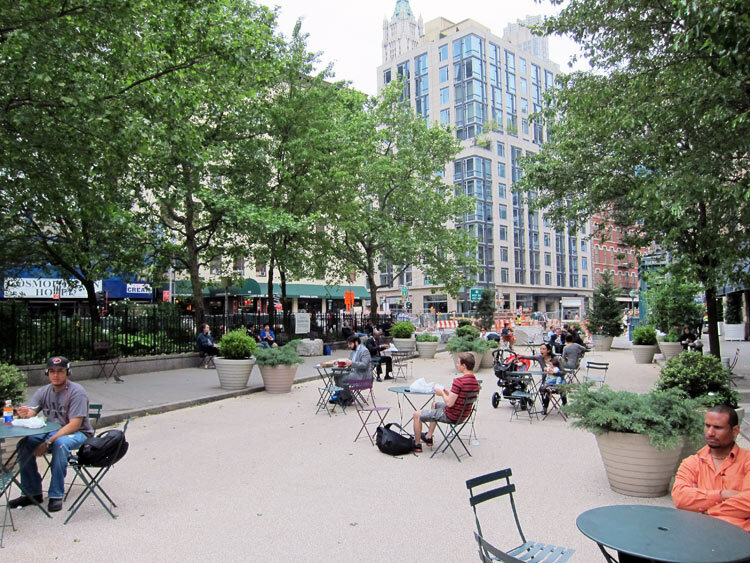 In 2010, the NYC Department of Transportation (DOT) painted the concrete green and filled the plaza with movable tables and chairs, designating the site as a permanent public space the following year. Now the Friends have received a $2 million grant from DOT to help make the space permanent. “The process of starting with a temporary plaza and eventually making it permanent is really a genius idea,” Nielsen said. “Eventually people get used to it and realize the sky isn’t going to fall in. 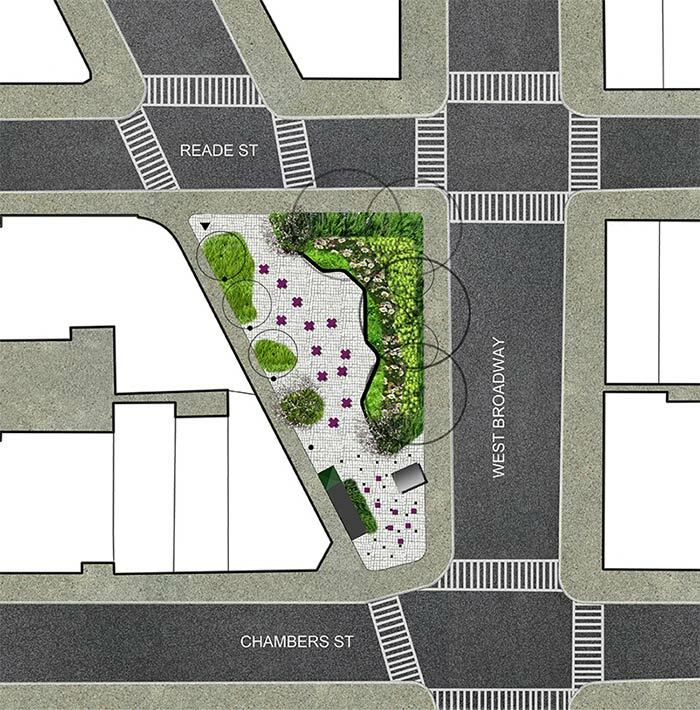 Its just incredibly smart.” She said making a very simple plaza arrangement permanent allows for designers to add new amenities to the public realm. At the southern edge of the 9,000 square foot space where pedestrian counts are highest, plans call for “short term seating” where visitors can stop by for five or ten minutes as they pass through. Farther inside the plaza, Nielsen has designed sunny and shady seating groups tucked into the garden where visitors might spend more time. Nielsen said the existing mature tree canopy served as “the bones” of the plaza’s landscape and plans will add a mix of height and color with flowering trees at each end with shrubs and flowers in between. At the north side, a clock will honor the plaza’s namesake James Bogardus and a new segment of fencing along West Broadway—for buffer and to keep people from walking through the garden—might include an homage to Bogardus’ few remaining buildings in the neighborhood. Space has been reserved at the south end of the plaza for a future kiosk. In addition to funding from DOT and $200,000 raised previously, the Friends of Bogardus Garden is in the process of raising an the rest of the funds for the $3 million project. Victoria Wiels, president of the Friends of Bogardus Garden, said the group is accepting donations for an additional $200,000 and has reached out to Manhattan Borough President Scott Stringer’s office and City Council for the remaining $600,000. She said a six-month final design process could begin this fall, with construction following the next year. Since the plaza is owned by the city, DOT has final say over which design firm is chosen, but Wiel said she is hopeful Mathews Nielsen will be selected.